The Hong Kong Flower Show was one of main public exhibition in Hong Kong every year. It was organized by the Leisure and Cultural Services Department. It attracted over 548,000 visitors. More than 200 organizations from 21 countries showcased their exotic flowers, landscape and floral art displays. The Photo Competition was one of three competitions in the show. Since the Olympic Game will be opened on 8 August 2008, the topic was named as "Vibrant Blossoms for Beijing Olympics". On 19 March 2008, Eric, Daniel, Henry, So, Kei, Bill and I took part in the competition. There was near 1,000 photographers and competitors that were striving to occupy the ideal location in order to capture the models' beauty. In the crowd, it was hard to shoot because I was often pushed. On 6 June 2008, the quarterly photo competition was held, which was organized by The Photographic Club for the Deaf. The competition theme was "Edge in Hong Kong", which was same as the photo exhibition organized by The Hong Kong Council of Social Service. Many deaf members took part in the quarterly photo competition enthusiastically, so over 100 photos were collected. The photographic club invited Mr. Hung Tak Fai and Mr. Ho Po Tim to become the judges of the competition who were the well-known professional photographers. 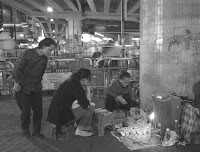 The Photograhic Club for the Deaf will join in "Edge in Hong Kong" Photo exhibition, which encourages the photographers to use their angle to capture the people at the margin in Hong Kong and to use their art work to light up people's concerns towards these people. More importantly, it promotes the networking and communication among civic groups and the public for promoting the strength of civil society in Hong Kong. Therefore, after quarterly photo competition, Mr. Auyeung Chi Kong who is the Instructor advisor in the photographic club wll select 60 photos to submit for exhibition. Either photo competition or exhibition, the hearing-impaired photographers can share their understanding of "Edge in Hong Kong" through their camera lens, thereby calling for more social attention and springing up more social concerns towards the needy. Over 100 photos for competition, two judges agreed the hearing-impaired photographers' fundamentals were excellent. They selected five winners through strict judgement. Fortunately, I won both a Champion and 1st Runner-up. The 1st Runner-up photo was taken under the bridge at Causeway Bay. 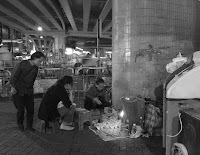 However, Mr. Hung criticized that the photo was dark and the sitting old woman failed to be got an attention in the photo because the rubbish bin on the front was easily attracted to the viewer. Therefore the photo should be retouched through tailoring (crop overlay) and adjusting the brightness as left. The Champion photo was taken at Yau Ma Tei on 17 May 2008. Originally, the standing persons' head was remained in the 4D sized photo. The top part was cut down as 4R size, so that it complied with the regulation of the photo competition. 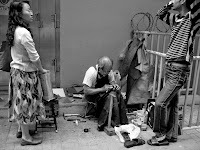 Hereby, the sitting shoe maker could be got the attention. Besides, Mr. Ho praised it because there was W-shape Composition for getting attention and delivering the photographer's message. After the judgement of competition, the hearing-impaired members and guest judges were taken a picture for memory. On that night, it was unforgettable for me.